LITTLE READER is the accidental love child of Ross Flournoy and Kate Tucker, spun from one golden afternoon in the hills of Los Angeles where they met in a garden to write their first song. One thing led to another and soon after, Ross was on his way to Nashville, where Kate and her favorite studio mates, Graham Bechler and Mark Watrous, welcomed him with open arms and lots of ¼ inch tape. THE BIG SCORE is available on iTunes, Amazon, Spotify, and Apple Music. 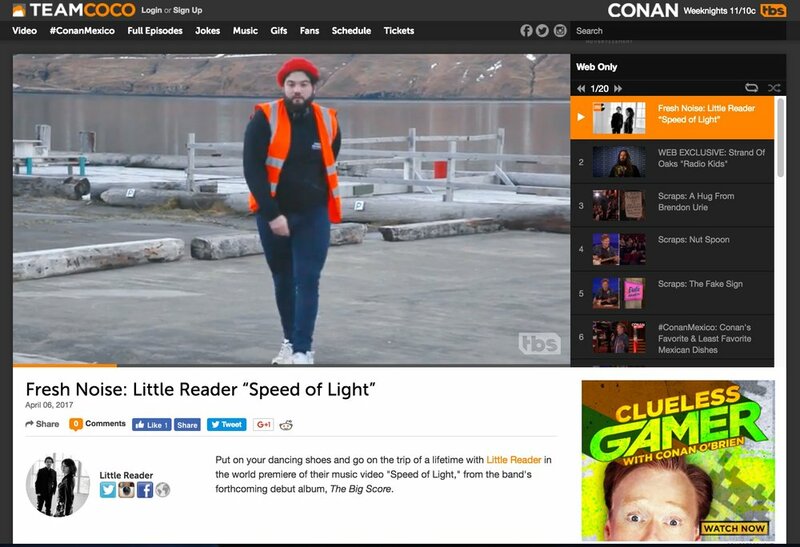 Conan O'Brien's TEAM COCO has the exclusive premiere for "Speed of Light," the first ever Little Reader music video, directed by Jessie English, shot in Seyðisfjörður, Iceland by Austin Thomasson and Dae Ja, featuring the marvelous Shan Turner-Carroll. Hear "Running Toward the Sun" on iTunes, Amazon, Spotify, Apple Music. Hear "Burn Eternal" on iTunes, Amazon, Spotify and Apple Music. Hear "Strange Lightning" on iTunes, Amazon, Spotify and Apple Music. Produced by Mark Watrous of the Shins, Little Reader's debut LP, The Big Score, is out now on iTunes, Amazon, Spotify and Apple Music. "All praise the pop song with the ability to part the clouds without filling your gullet with sugar... Kate Tucker and Ross Flournoy have had success writing music for film and television, but as Little Reader they score with the album The Big Score." Download "Selected Readings from the Big Score" -- 4 tracks from Little Reader's forthcoming debut The Big Score out May 19th, 2017. Pop Dust Premieres "Burn Eternal"
"New pop duo Little Reader channels The Pretenders on latest single from upcoming debut produced by Mark Watrous of The Shins... utilizes polarizing emotions and ideas to hammer home heightened reality... cemented their sun-bleached version of pop to great effect." Conan O'Brien's TEAM COCO Debuts "Speed of Light"
"Put on your dancing shoes and go on the trip of a lifetime." From the The Big Score, the forthcoming debut by Little Reader, produced by Mark Watrous (The Shins, Earl Burrows), and recorded at Strange Attraction in Nashville, Tennessee. The Big Score arrives May 19th.